Left: Diagram and Animation of the solar wind interacting with the atmosphere of Venus. Credit: ESA/C. Carreau. Right: Close up of Ankhsunamun’s 'comet’ crown on the back ofTutankhamun’s throne. While there is a wealth of literary sources to draw upon, when it comes to the pictorial evidence it isn’t as forthcoming. No images can be conclusively identified as actually representing Venus in cometary form, a situation that essentially shouldn’t exist. After all, it stands to reason that it was naked eye observations that primarily inspired the myths. So, at the very least the imagery should be equal to or analogous to the literary sources – but this clearly isn’t the case. The image on the right has been taken from the back of Tutankhamun’s throne. It depicts the wife of king Tut, Ankhsunamun. The queen is shown wearing a very distinctive crown consisting of a disk surmounted by cow horns and two tall plumes. This unusual headdress made its appearance in the New Kingdom and features prominently in Egyptian art - numerous queens can be seen sporting this particular crown. Although the actual shape or outline remained constant (for approximately 900 years), there exist a few variants to the colours shown. For example, the disk was predominantly painted the traditional Egyptian deep red, the ‘horns’ normally black, while the plumes can be gold, a plain yellow, or blue and without the ‘filaments‘. Like most Egyptian crowns encompassing a sphere, it somehow represents an aspect of the sun, or so the conventional way of thinking goes. This is a perplexing line of thought since the Sun is a golden glaring ball—it doesn’t have cow horns wrapped around it and most certainly exhibits no signs of enormous cometary tails. It is apparent even to the uninitiated that what we are looking at here is a comet—a large comet with a plumed tail. Furthermore, if Egyptian art is used as a measure of time, this comet graced our skies for nearly a thousand years. It is carved, painted, and represented in statues the length and breadth the of Nile valley. Even the legendary Cleopatra wore this headdress. Could this particular crown be a true-life physical representation of proto-Venus as it appeared in ancient times? 'In the electrical model of the solar system, any body on a sufficiently eccentric orbit about the Sun will exhibit cometary features. For ancient people to have seen Venus as an Earth-threatening comet, Venus must have had an eccentric orbit that brought the planet near to Earth'. Comparing the comet crown with the Venus diagram on the left reveals some fundamental similarities, far too close to be deemed coincidental. In fact, for all intents and purposes they are virtually identical! The orb represents the body of Venus: the horns signify the bow shock as the solar wind slams into the Venusian surface, enveloping its body due to a lack of an intrinsic magnetic field. 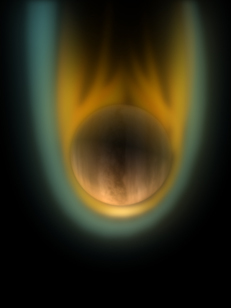 The two large plumes represent Venus’ magnetotail—split in two and flowing downstream at least three times its diameter. The image on the left is just a diagram, and today Venus’ comet tail can only be detected by magnetometers and charged particle detectors. However, place Venus on an eccentric orbit in a highly charged ‘dusty’ environment and the normally invisible magnetotail (and bow shock) would become highly visible. 'A power surge in those filaments today would cause them to glow, and Venus would form a "stupendous" cometary apparition in the sky. The forensic evidence would stand up in court, showing that Venus was a comet within human memory'. Comet Venus - was Egypt a warring nation? summary of the unverified battles of pharaohs from "An ancient world in chaos"
** without a scratch - the warrior kings including the mummified and studied bodies of Ramesses the Great (Mars) and Tuthmosis III (Moon) have no war wounds. Those planetary bodies do show signs of wars in the skies. ** what of the power vacuum? - the king stopped the cosmos falling into chaos. would he leave egypt for months? ** the afterlife - the be all and end all for egyptians who needed to be mummified and buried in egyptian soil to enter the afterlife. would they keep going abroad to fight these battles and risk no afterlife? ** no archaelogical evidence - this includes the Battle of Kadesh where battles were fought many times by different pharaohs. the battles of the pharoahs seen in sacred texts and images were fought in the skies by the warrior kings, their planet double, that is why there is no evidence for them. ** Megiddo - hill in isreal, fought over for 3000 years, Tuthmosis III fought 18 battles here and other pharoahs did - no archaeological evidence or remians of battles. The Megiddo hill itself was not even fortified although Tuthmosis III laid siege to Megiddo for 7 months. ** where are the remains of the weapons, chariots, horses, bodies? Egyptians said to "recycle" ALL weapon bits and bodies or bodies dissolved in the limestone soil. ** where are the enemy dead? if egyptians then carried all their dead heroes home why are there no mass graves in these locations for the enemy? The Egyptian Arc and its processsion on a boat? Copied from God's Fire (chapter 4 - The Ark in Action) Alfred de Grazia mentions an Egyptian Arc and suggests it is datedto around the time of the planet Venus as a Comet. The Ark of the Covenant, so named because its hollow interior probably contained at first solely the stone tablets that Moses had brought down from Mt. Sinai with the words of Yahweh, measured probably between 45 X 27 X 27 and 63 X 38 X 38 inches, That would be close to the bulk size of a secretarial desk. Tradition maintains that the Ark itself was fashioned by Moses, and, of course, the design was his, dictated to him by Yahweh on the sacred mountain. An ark "denotes here a kind of chest or box." Its Hebrew word is ‘aron.’ It may have meant once something other than a box; that is, the structure embracing the function may have appropriated the name of the function in later ages. The root of ‘aron,’ says Strong's Concordance, signifies a gathering in; in this case, charges are collected and Aaron is the collector. The name of Aaron thus may be closer to the function, the priest of the ark or arc science. Flinders Petrie, the greatest of Egyptologists, used the word 'ark' to describe one of a number of Egyptian depictions, such as is portrayed in Figure 10 here. One is tempted to speculate that it is an engineering sketch of the Ark itself, lacking the box below. There would be little reason for the construction of these poles or this arch, aesthetic or otherwise, except to manage an electric arc or system of sparks. This ark in operation would flare at the junctions of the grounded poles and the top horizontal bar. gather more readily because of high conductivity of the medium. Especially in pre-cometary or post-cometary times, when the Earth was discharging less strongly, the ark as pictured in the illustration would create a more active arc discharge. Figure 10. Egyptian Ark Procession (Note: The figure has two pictures. Click on each of them to get an enlarged view. Secondly we revert to the puzzle of why the Jews named the Ark of Noah and the Ark of the Covenant similarly. The answer is probably that the electrical phenomena of Noah's Ark were stupendous, that the Egyptians generated their arcs on boats, and that Moses derived his land-based Ark from the aquatic models. These may have descended to the Egyptians from the Noah tradition via the Hebrews, or have been a joint Egyptian-Hebrew development, or may have been indeed Moses' invention, whether in the aquatic forms or the land form or both. Regarding this last item, we may recall that Moses the infant floated on the Nile in an "ark", the same rare word. thrown into a great variety of beautiful forms." With various adjustments, all of which were recapitulated in the renaissance of electrical science in the eighteenth century, the poles or bars could be made to scintillate throughout their lengths, the wings of the cherubim would light up, and a glow would occupy the space beneath or shrouded by the wings, with the four ankhs (pictured at the corners in Figure 10) sparking like brilliant erratic candles. A god was present. The only meaning of 'Ark' in the dictionary of Egyptian hieroglyphics is the name of a god. But when was this Egyptian ark constructed? Was it for a shrine made before 1450 B.C. or afterwards? The ankh answers the question. It is the paramount symbol of the planet Venus. Though it is also a symbol meaning 'life' and 'salvation' and the procreative membrum virilis, it reverts to Typhonic Venus in the end . Therefore it is mostly of the period after 1450 B.C., by the chronology I am following, Thus were joined the Ark of Noah, the Egyptian ark, the ark and ankh of the gods, and the Ark of Moses. ** egyptologists have said that battle scenes on temples are for battles that do not exist and also "stock images and names" on different temples! evidence for the dusty nature of our solar system and Hathor etc? ** for 3000 years during the GKS (God King Scenario) earth was battered by cosmic rubble and this was seen in the skies and evidence is on the planets surfaces. Creation of the Himalayas and Andes during this time. Earths solid outer core broken into the plates we have today. ** Pleistocene era catastrophically ended 3000 years ago as suggested by Velikovsky, Meteor Crater in Arizona from part of the metal core of Mars during that event. ** Sand and the earths deserts - sand takes millions of years to form but Sahara was fertile 5000 years ago. Where did it and the great sand belt around the world come from? Space debris from Mars. Sekhmet enjoyed a close relationship with the celestial kings. The pyramid texts twice mention that the king was concieved by Sekhmet. She protected the king in battle by stalking the land, destroying the phaoroh's enemies with arrows of fire. We can relate this to the large couds of fiery meteors which streaked across the skies ahead of the pharonic Mars as it crashed headlong into tons of debris. The "Re (Ra) the Red Sun" is taken from a page on Gary Gilligans website (God King Scenario - Re (ra), the Egyptian RED sun God?) and his book Comet Venus, which is being discussed in this thread. A hazed red Sun, planetary chaos, and a solar system besieged by dust and debris. 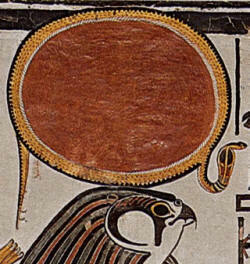 The Egyptian Sun god Re was typically represented as a sun-disk, or as a falcon-headed man wearing a red sun-disk on his head. Such imagery points to the god’s solar character. The following epithets present traits which are consistent with the life-giving properties of the Sun experienced today. Lord of all lands...praise Re when he riseth at the beginning of each day. ’s most basic form consisted of a simple red disk. Why was this? Why not portray the Sun as it appeared? – a ball of glaring, golden light. A red disk is drab and lifeless by comparison, and yet Egyptian art reveals not one single golden glaring Sun with a complete 360° sweep of sun rays. A perplexing situation, especially when considering that gold was the flesh of the gods and Re was the Sun god par excellence as epitomised in the godly pharaoh's title sa re, which means ‘offspring of Re’. Whether Velikovsky's Comet Venus was the largest 'volcano' in the solar system, spewing out countless tons of sulphurous gas from its many thousands of volcanic vents, or Mars was disturbed from its orbit to undergo a catastrophic transformation, the result of any cosmic catastrophe would have been the release of immeasurable quantities of debris, dust and gas. This debris eventually settled down into the plane of the ecliptic where it impacted the planets, the Moon, or fell into the Sun. To understand the effect that a stream of dust and gas 93 million miles long had on the Sun's appearance, we need look no further than the art of the Egyptians. Their portrayals clearly reveal the red haze that surrounded our Sun. The Egyptians carved, drew and painted a red Sun because all they ever experienced was a red Sun. Furthermore, if the duration of Egyptian dynasties is anything to go by, our Sun was hazed red for an incredible 3,000 years. The supposition that ancient cultures only experienced a diminished red Sun is both profound and exciting. It allows us to take much of the art and many seemingly bizarre beliefs at face value. Not the least being the fact that a hazed Sun means there was no glare, so they were able to look directly at the Sun without being blinded. This led to naked-eye observations of electrical phenomena such as coronal mass ejections (CMEs), flares, and prominences. The image on the right at the top of the page depicts an Egyptian Sun encircled by a yellow royal uraeus serpent which was known to spit fire and venom at Egypt's enemies. 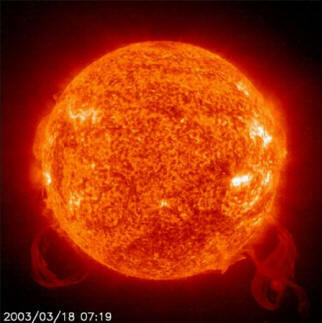 The image on the left was taken by SOHO and can be used for comparison, providing some idea of how the Sun appeared in a world dominated by cosmic catastrophe. The cobra is a symbolic representation of vicious CME’s 'striking out' several times the diameter of the Sun at sungrazing cometary bodies: snakelike CME's protecting the body of Re by spitting fire at Egypt's enemies. In ancient times, those eruptions might have been observable on a daily basis and perceived to be a perennial battle against the forces of evil. 'Comet NEAT swung close by the Sun in 2003, apparently initiating a CME eruption that appeared to impact the comet. Astronomers at the time discounted any relationship between the two events because of the size differential between the comet and the Sun. However, several other sungrazers have been associated with violent flares. One event can be a coincidence, two can be long odds, but three or more cannot be dismissed as mere oddities'. 'It did not rapidly dissipate, however. Instead, its intense charge differential caused a gigantic CME to discharge from the Sun, blasting out for millions of kilometers'. The yellow coronal ring encompassing the snake represents the highly charged million-degree corona of the Sun, bursting through as a yellow ring due to its 20 million degree temperature. Gold really was the 'flesh of the gods', as bursts of golden energy were also observed emanating from the body of Re, as in the image above. Egypt today has one of the most sunniest and driest climates in the world. Its sunsets and sunrises invoke thoughts of serenity and are a sight to behold. In total contrast, the ancient Egyptians believed Re's daily path across the sky was fraught with dangers. It was believed that the setting Sun prompted a perpetual nightly battle with the demons of the underworld. It was a doomsday scenario, and they believed that the Sun might not shine the next day. The fighting aspect of the Sun is also played out on Mesopotamian cylinder seals. The 'dispenser of divine justice,' the Sun god Utu/Shamesh, is shown with fiery solar 'rays' (CME's) emanating from his shoulders. He also holds a pruning-saw. He is depicted cutting his way through the eastern horizon to again rise victorious. On some seals the snakelike shoulder rays end in stars, indicative of CME's zapping space debris.Upon consideration, a red Sun at war opens a window to many ancient enigmatic beliefs. ** Amun (Amen, Amon) = king of the gods known as "the hidden one" and pharaohs used his name, for example Tut-ankh-amun. Amum was the the earths increased aurora during the God King Scenario millenia. ** catastrophists normally associate Amun with Jupiter as its the largest planet but how did the ancients know this and why was he not linked to one of the brighter planets like venus, saturn, mars? Egyptologists link him to the sun. ** the ancient cultures who lived at that time would have seen Hathor arching across the sky, Re the red sun, the God King planets and Amun. ** Amuns crown was flat topped to show that he was more associated physically with Lower Egypt, the earth. Amun was the king of the egyptian gods and his skin was shown as blue. this reminded me of Hindu god Vishnu who has always stuck in my mind because his colour is described as the blue of new clouds and its not a colour i have seen that often. if garys ideas are correct then perhaps many other gods can be explained in a similar way. of course they may be variations of a theme so they will be alike but i wanted to see if there was any links between them or things that could show EU Theory. Vishnu is the supreme god. 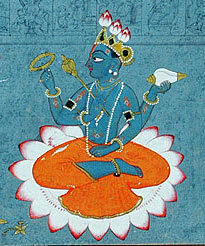 In the Puranas, Vishnu is described as having the divine colour of clouds (dark-blue), four-armed, holding a lotus, mace, conch and chakra (wheel). Vishnu is also described in the Bhagavad Gita as having a 'Universal Form' (Vishvarupa) which is beyond the ordinary limits of human perception. * A conch shell or Shankha, named "Panchajanya"
* A mace or Gada, named "Kaumodaki"
Few people, however, revere the cow like the world's 900 million adherents of Hinduism. Since the faith first evolved near Asia's Indus River more than 3,000 years ago, respect for animal life has been a central theme in Hindu life. While many scholars say early Hindus ate beef, most ultimately came to see the cow as a sacred animal to be esteemed, not eaten. "If someone were to ask me what the most important outward manifestation of Hinduism was, I would suggest that it was the idea of cow protection," Mahatma Gandhi, India's legendary nonviolent leader, once wrote. Although Hindus follow no single set of rules, reverence for cows can be found throughout the religion's major texts. Some trace the cow's sacred status back to Lord Krishna, one of the faith's most important figures. He is said to have appeared 5,000 years ago as a cowherd, and is often described as bala-gopala, "the child who protects the cows." Another of Krishna's holy names, Govinda, means "one who brings satisfaction to the cows." Other scriptures identify the cow as the "mother" of all civilization, its milk nurturing the population. Is the timing of the appearence of Kirshna in step with the God King Scenario / Comet Venus and the cow, nurturing theme? In Hindu mythology, the Ocean of Milk is the place where 13 precious treasures were lost. The gods and demons worked together for a millennium churning the sea to free them. It is spoken of in the Samudra manthan chapter of the Puranas, a body of ancient Sanskrit legends. It is also the place where Vishnu reclines over Shesha Naga, along with his consort Lakshmi. "Ocean of Milk" is the English translation of the Sanskrit terms k? ?roda, k? ?radhi or k? ?ras?gara, from k? ?ra "milk, curdled milk" and -uda, s?gara "water, ocean" or -dhi "receptacle". A bas-relief at the temple of Angkor Wat in Cambodia includes a depiction of devas and asuras working together to stir up the Ocean of Milk in an attempt to free the precious objects lost within, including the elixir of immortality called amrita. The scheme, masterminded by Vishnu, was to wrap the serpent Vasuki around Mount Mandara, and then to rotate the mountain and to churn the surrounding sea in the manner of a gigantic food processor, by alternately pulling on the serpent's head and then on his tail. hathors braids? birkeland filaments sheath? [Above (left): Virtual image of the intense auroral plasma column as viewed at an angle of inclination, not to scale. Above (right): Conceptual view of the Birkeland sheath filaments surrounding Earth (28 close pairs). is this a possible explanation for the braids of Hathor? not saying it explains Hathor but maybe this imagery? also a possible explanation fro the sprites/papyrus reeds images seen associated with Hathor? Left: The god Amun adorning his traditional 'aurora' crown and his sacred colours. Credit: Neithsabes. Right: Photo of the Aurora Borealis. Credit C. Anderson. Planetary chaos and intense geomagnetic storms encapsulated in the 'king of the gods' Amun. Auroras are striking displays of coloured lights often seen over the Earth’s magnetic poles. They occur when the solar wind particles trapped by the Earth’s magnetic field collide with molecules of air in the upper atmosphere (ionosphere). They are a spectacular sight and take the form of rapidly shifting patches of colour and dancing columns of light of various hues. The colours observed depend on several factors such as atmospheric conditions, intensity of the solar wind, temperature and location. The aurora is always present in almost every area of the sky, but it is usually too faint to be seen except near the North and South Poles. The intensity of the aurora is dictated by the solar wind, a stream of electrically charged particles from the Sun. When the solar wind blows exceptionally strong, the aurora increases. When the Sun is in the active phase it can unleash powerful magnetic storms that disable satellites, threaten astronaut safety, and even disrupt communication systems on Earth. Amun is most commonly shown entirely in human form. Often he is standing or sitting on a throne wearing a red, flat-topped crown with two tall plumes and holding a sceptre in his hand. Thousands of images of Amun are to be found throughout the Pharaonic Egypt. The enormous temple complex of Karnak was the principal home of Amun where he was worshiped as the prominent divine entity. During the New Kingdom, his popularity eclipsed that of other major deities so much so he was referred to as the ‘king of the gods’. 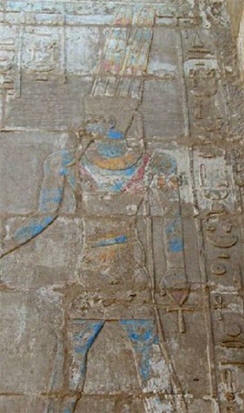 The image on the left depicts Amun in typical form with blue skin, yellow kilt, and red flat-topped crown with tall plumes segmented into sections of blue, red and green (?). A thin yellow frame separates these 'sacred' colours. The Northern Lights photo on the right depicts a plumed or pillared aurora with similar colours i.e. mainly blue supported by green, red and a hint of yellow. Comparing Amun’s tall plumes with the aurora photo it is apparent they are clearly a symbolic representation of intense geomagnetic storms that dominated ancient skies. Amun’s colours were at times interchangeable. Although his flesh was predominantly blue (main sacred colour), some images reveal a red coloured flesh. His segmented plumes were sometimes coloured yellow or white, as too was his crown. The plumes were often depicted devoid of segments and were painted just one colour, normally yellow or white. The main colours of the aurora are blue, yellow, red and green and any variants in Amun's colours merely reflect the hues seen at the time which could change on a daily, weekly or monthly basis. Sometimes red neon lights covered the entire sky, other times blue, green, yellow, white or a combination of all colours. The Egyptians reflected what they saw in their art. The aurora manifests itself in many forms including homogenous arcs, bands, active arcs, rays, pillars, plumes, draperies (or curtains) and coronas. The aurora variations are reflected in the epithet which describes Amun as the 'One creator who has millions of forms & transformations'. Amun was also known as ‘the hidden one’ and the ‘one whose true form could never be known’. Such 'hidden' traits reflect the transparency of the aurora. 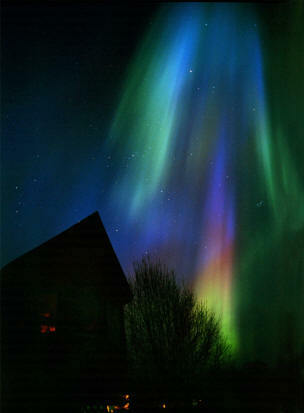 Unlike the light emanating from the body of the Sun, the auroral light had no solid body or attributable physical 'form'. In this respect the Egyptians had a blank canvass, and so chose to encapsulate the aurora as a human being adorning auroral hues and a plumed auroral crown. The solar wind is deflected around the earth to form an enormous magnetotail which can extend more than 3,976,766 miles out into space. It is divided into two lobes, or tails, rising and setting in opposition to the Sun. Today it is invisible. From the point of view of Earth's horizons it appeared as two mountains with the title 'Lord of the Two Mountains'. Those electrical apparitions were also attributed to Amun. It's probably why he wore two plumes on top of his crown and not one, or three. During that period all close proximity planetary bodies exhibited highly visible electrical traits (this would include the cometary plumes of Comet Venus). These were all attributed to Amun. It is the very reason why the omnipresent Amun/aurora rose to prominence to become the 'king of the gods'. Perhaps 3,000 years of cosmic catastrophe is staring us in the face by way of every façade the length and breadth of the Nile Valley. when discussing the "Dendera Lightbulb" or plasma discharge i did not realise at the time that the Temple at Dendera is a Temple to Hathor i have made a reply to a post on thunderbolts about the subject of the Dendera Lightbulb. Temple of Hathor before it became a tourist site. This building has no statues or figures of Gods all over it , so it leads one to conclude that it had other uses. 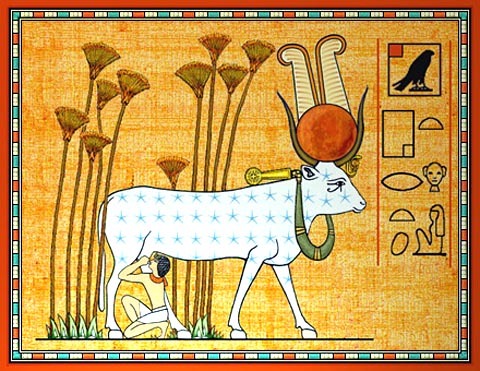 are these the papyrus leaves shown in the image of hathor as the cow in the sky with the papyrus leaves and the white band? Resomtus is alive with gloss in the sky (and) lives at the day of the New Year celebration. He lights up in its house in the night of the child in his nest, by donating the light to the country from the birth bricks. The sky is jubilant, the earth is pleased and the God chapels is glad, when he appears in his chamber in his procession barge at his beautiful celebration of the New Year. The God with his disk has come to see him. Nehebkau gives him reputation, and the goddess with her disk, with godly body, rejuvenates him in his sanctuary. Tchnt tpjt jnr is content because of her majesty. She praises Re because of him with praise for his Ka, with wine from schfjt and meat bits on the altar before him. The "land-of-Atum" is prepared with his most distinguished plan, as Hu and Sia are subordinated to him. He may protect the son of Re, forever. gary gilligan has posted a new part to his God King Scenario about the winged disk. Below is a copy of the article from his GKS site. the original article has a few links in it so its best to read it there. The winged disk is a familiar emblem found in Egypt, Mesopotamia, Anatolia, and Persia. It can be found carved over temple doorways, on the rounded top of stela (as above) and on many papyri. It was the symbol of Horus Behdety and is often associated with the Pharaoh (Horus, the embodiment of kingship). It has been the subject of much discussion and debate among catastrophists and Egyptologists alike.What does it represent? Egyptologist Sir Alan Gardiner argued that the disk represented the 'actual person' of the of the king, syncretised with the sun-god (Dictionary of Ancient Egypt. Shaw & Nicholson, 2002, p305) Was he correct? Does the disk in the image above represent the god king Amenhotep? The God King Scenario (GKS) forwards the radical proposal that the divine monarchy of ancient Egypt (& Mesopotamian cultures) were first and foremost guises of the planets Mars, Venus, Mercury and the Moon as they played havoc with earth for 3,000 years. These heavenly monarchs were represented by human 'doubles' - mortal Pharaohs who were believed to be the human incarnation of astral bodies. The errant planets were named and renamed numerous times over as they appeared to move back and forth to Earth. This paralleling the historical and chronicle record of the pharaohs carved on temple and tombs walls throughout Pharaonic Egypt. It would be wise to attribute phenomena such as electrical manifestations, ecliptic dust, light refraction, zodiacal light, earth's rings, etc. etc. with Egypt's cosmogonical gods and goddesses such as Amun, Isis, Hathor, Osiris etc. These sky deities housed, nurtured and granted kingship to the kings as the appeared within and interacted with such phenomena. The scene carved on the stele above is believed to be mythological in context i.e. we have a human king of equal stature interacting with an fictitious god. This conventional interpretation is incorrect. The scene represents real events in the heavens. This would apply to all sacred scenes and accompanying text throughout dynasty Egypt. Amenhotep was just one of the many names given to the warring Mars. Amenhotep III is represented three times. Primarily as a winged disk at the top of the stele and in human form either side of the carved stone. The winged disk is a true physical representation of Mars/Amenhotep when in close proximity to earth. The adorning of outstretched wings was probably due to the solar wind stripping the spinning Mars of its volatiles. Mars, with its magnetic field still intact, buffering the solar wind to form two ginourmous outstretched cometary wings. Either way, from the perspective of earth, the Egyptian's portrayed almost exactly what they saw. Identifying the disk with Mars/Amenhotep is made perfectly clear by the placing of the kings cartouche directly below the disk. It contains the throne name of Amenhotep 'Nub-maat-re.' Another Re title meaning 'Lord of truth is Re.' Amenhotep was also given the highly significant title 'the dazzling sun disk of all lands.' This is a clear reference to a celestial body adorning similar attributes to that of the Sun. Only in this case, and at this particular time, Mars' luminosity was more 'dazzling' than the hazed red sun of ancient times. Intense geomagnetic storms (aurora) were deified as the great god Amun. Mars, in appearing amidst the aurora was adorned with the name Amen-hotep, meaning the aurora/Amun is content. Mars/Amenhotep in 'seeking excellent things for his father Amun' is perceived as 'offering' (spinning off volatiles) to the aurora/Amun. Amun reciprocates by granting the astral king 'life' (ankh) and the authority to literally reign over earth, within the aurora/Amun. In answer to the question, was Gardiner correct in his assumption that the disk represented the 'actual person,' the answer has to be yes, only more than he could have ever imagined. gary replied to a post i made on the thunderbolts forum discussing the Dendera lightbulb. I have copied his reply below and you can read his original reply here. If I may make some brief suggestions. Located mainly around earth's celestial equator, Hathor was earth's ring system of ancient times. Isis was responsible for the ecliptic haze. These two nurturing goddesses were interchangeable as the ecliptic and earths celestial equator crossed throughout the day and the year. Hathor, and to a larger degree Isis (ecliptic haze) hazed the Sun red exactly as depicted. Hathor, as earth rings was said to receive the red sun each evening and protect Re until the following morn. The Egyptian kas, the souls, or doubles of the Egyptians are believed to be some kind of invisible spirit - a figment of ancient minds, this is incorrect. In a world dominated by cosmic catastrophe, Hathor and Isis housed numerous bodies. These were perceived as the doubles of the Egyptians. A 'soul' (ka) that they believed they would join with after death to ultimately live a life of eternity as a star in the firmament of heaven. Heaven perceived as a fixed land above held up by the Djed pillar, which symbolised the four posts holding up the sky. Seemingly appearing within Hathor (Hat-hor = house of the god king planets) were many electrical apparitions, such as sprites which were represented the papyrus flowers (as mattEU's images), and the aurora (Amun) which filled the sky. If I could draw your attention to Stephen Smith's TPOD article. It highly likely these snake-like streams of plasma were occasionally observed with dust granting visibility to the otherwise invisible. Close proximity personified bodies (as in the images) probably playing a part here in boosting their luminosity. From earths POV providing a good deal of brilliance and almost light-bulb like apparitions. The Dendera light-bulb carved in Hathor's temple, because this is exactly where it was observed, seemingly within earth equatorial ring system. Accepted, the precise and exact definition of the 'light-bulb' images will probably never be known. However, I will say with a good deal of confidence is that it represents events in the heavens and has little if anything to do with events on earth. Apart from, of course the Egyptians, recording such apparitions.